The dynamic characters in Kingdom of the Young are searching: for adventure, work, love, absolution, better chances elsewhere. In a symphonic stream of consciousness, a fanatical child army loses faith in its commander as he ages unforgivably into his thirties. A woman possessed with wanderlust and a small inheritance seeks love among the cave-dwelling Roma in Granada. Traumatized war veterans run local rackets; smarmy bureaucrats rise through the ranks of repressive regimes; civilians attempt to escape the stranglehold of life under dictatorships. From the honeycombed caves outside the Alhambra to the streets of Havana, from hospital wards to quinceañera parties, these stories—along with the collection's illuminating nonfiction coda—testify to Meidav’s vast imaginative range. "A penetrating collection that glides among an impressive breadth of storytelling modes with warmth and easy brilliance." "Stylistically virtuosic collection...Meidav favors long looping sentences as full of life as her characters." Ambitious, original, deliciously philosophical. Kingdom of the Young invites comparison to the crônicas of Clarice Lispector and the fabulas of Italo Calvino. This astonishing book offers us so many memorable characters who are real in such surprising ways. This is a book which unpeels its many layers with grace, searching intelligence, and deep empathy . The surprises here do not feel manufactured in the usual literary ways but rather reveal themselves to us suddenly, with the natural clarity of truth. In every single bit of Meidav’s work, the prose is dazzling. Reading Kingdom of the Young, I was often reminded of two of my favorite writers, Nabokov and Gass. These stories are dazzling, full of knowledge of the world and of the heart, and written with the pluck and thrum of a flamenco guitarist. Meidav draws you into world after world; she makes you want to sit by your window and listen all night. The kingdom of the young. Oh what imagination. Oh what story-telling. What beautiful language. What more do you want? Go ahead a nd be greedy like me. Meidav, a prose stylist of the first rank, has got us covered. In Kingdom of the Young, whether Edie Meidav riffs on Cuban dogs or ‘a tiny pert woman in a cherry tracksuit’ called Hummingbird, she unfurls a mean sentence. ‘Look at a soldier’s face in one of those moments you don’t want to remember and then you know exactly what lacking imagination looks like,’ Meidav writes in “Catullus.” A collection of surprises, with a sparkling nonfiction coda. I loved this book. Her stories and essays make a whole—a brilliant pairing, each part informing the other, with mutual gravitas and depth. There are two Edie Meidavs here and I love them both. Edie Meidav’s writing is a cascade of fireworks. Her ideas are little bombs—and these stories, fast-spinning sparklers. Her hallucinatory prose flares with color and heart. Kingdom of the Young will engage readers for its clear authority, musical language and surprising empathy. 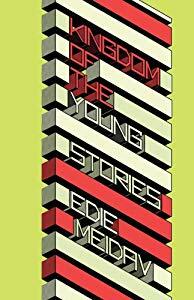 "Edie Meidav's collection of short stories Kingdom of the Young transports readers to unconventional experiences and submerged feelings of the past."